Milwaukee was hit with a big blizzard today, dropping 16" of snow across the entire area. Around 3pm, I took a break from work to clear our snow, and was shocked by just how much white stuff was in our driveway. Our neighbors helped me shovel, and a little later, Nathan came out to play. I took a few shots of him climbing the Mount Everest pile near the driveway to give you an idea how much snow we've got up here. I have great memories of snow from my childhood but we seem to get next to none in the UK these days. And who says global warming isn't a reality? Looks like a real winterblast... get it? oh, I kill me. 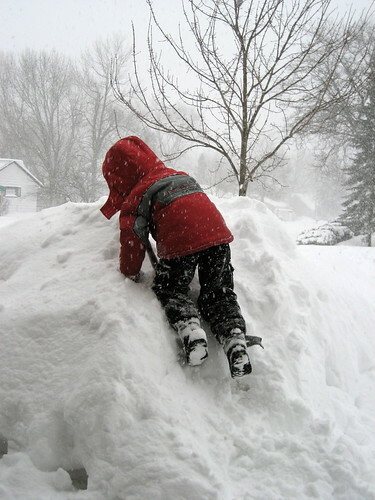 I have good memories of snow from my childhood, too. It really is a great time in a kid's life. That looks incredible. I miss the snow (a little), since currently its about 82 here in South Florida. We are lucky there is a cool breeze at night. David, yes, that is indeed some snow. Just got done raking our roof and man, it was heavy up there too. Alex, are you originally from the midwest? Oh how I miss the snow. Here in Central NJ we used to get snow like that but lately it seems not. Yesterday it was 70 degrees!! in early February! I too have enjoyed reading your blog, I started here because I was searching for stuff about using an iPod Touch as a PDA, but have enjoyed much of your stuff on design etc. I'd like to do it if it synchs well with my Microsoft Office Apps on my PC. What say you in that regard. Not mid west, New York. Well, that's awesome!! Coming from Brisbane Australia, that's awesome. I can't believe that someone can walk outside and be facing that. It's like a movie to me. Very cool!! Heh, Craig, it's very cool until you have to shovel it. Every. Week.